Before moving to Sydney, Connie Chen was an active soloist and chamber musician in Vienna and Beijing. She has performed two recitals in the Musikverein (the Golden Hall) in Vienna in 2008 and 2009, and appeared extensively around the Europe in music festivals and masterclasses. She was also the sectional cellist in Junger Philharmonic Orchestra in Vienna. She has studied in Universität für Musik und darstellende Kunst Wien with Prof. Stephan Kropfitsch and Prof. Wolfgang Herzel, the Head of the string of Universität für Musik und darstellende Kunst Wien and the principal cellist of the Vienna Philharmonic. She has also studied chamber music with pianist Prof. Mrialiana Fernanders in Vienna. 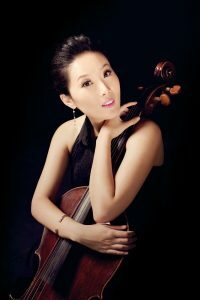 Connie Chen started learning cello at age of 7; she was admitted to Xiamen School of Music at age of 9. She has joined the Xiamen Opera House for 2 years before she was admitted to the Central Conservatory of Music at Beijing started to study cello performance with professor Zong Bo, Ma Wen and Sun Xiao Qi. During her stay in Beijing, she has joined the Symphony Orchestra affiliated to the Chinese People’s Liberation Army, Beijing. She had tour around China for many times and performed for the president of China and France at the state banquet at 2004. She has also collaborated extensively with China Central Television for recordings for TV drama productions and gala events. She was be a cello teacher in Singapore,she has also joined various performing groups in Singapore such as the Philharmonic Orchestra of Singapore and some other chamber music groups.